A collection of easy recipes designed for the Instant Pot. Each of these Instant Pot Recipes includes step-by-step directions and troubleshooting tips for pressure cooking. All of these Healthy Instant Pot Recipes are made with wholesome, real food ingredients. Who is in love with their Instant Pot? Who has bought an Instant Pot but it is still in the box? Who has used the Instant Pot, but has not been sold by the results? 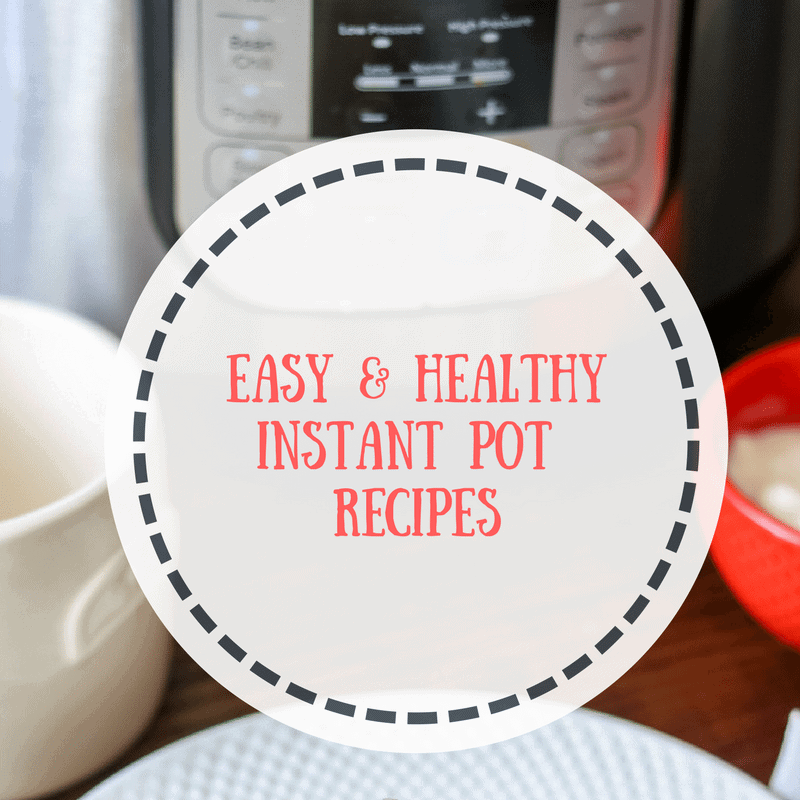 Regardless if you are a die-hard Instant Pot lover, a Instant Pot Newbie, or an Instant Pot skeptic, I have you covered with easy, healthy Instant Pot recipes. Now, it is time to break out that Instant Pot, follow my advice, and be ready to fall in love with the ease of pressure cooking. First you need to start off with my Instant Pot 101: I walk you through the essentials of electric pressure cooking. If you are looking for a detailed explanation of what Instant Pot Functions you should use, I have you covered (and you may be surprised to hear how I suggest you IGNORE these functions). 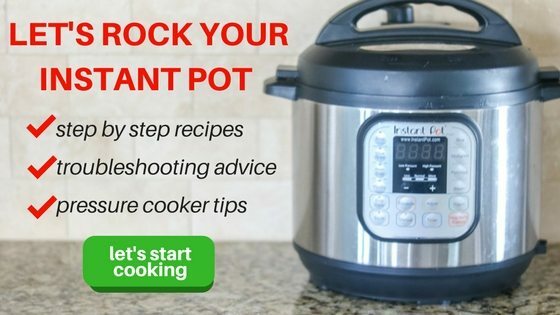 If you are looking for what to do if your Instant Pot won’t seal, I have you covered there as well! And if you are looking for Instant Pot Recipes–you are in the right place!!! These are the basic instant pot recipes that show off the magic of the Instant Pot with basic recipes and how-tos for pressure cooking. Directions on cooking frozen and fresh chicken breasts. This recipe has been a fan favorite for a long time. And it is all because of my secret ingredient I cook the chicken in. You will NEVER buy stock again, the instant pot cooks absolutely perfect chicken broth. And why limit yourself to just chicken broth? Use this same method for beef or vegetable stock in the instant pot as well. If there was ONE thing I had to select was my FAVORITE thing to make in the pressure cooker, it is hands down dried beans. I will never buy canned beans again. Talk about a money saver! Look no further than a this recipe for baked potatoes in the pressure cooker, for the PERFECT baked potato recipe. This method rivals restaurants. Trust me on that! There are SO many recipes for Instant Pot Sweet Potatoes, but mine is the BEST! If you want a fall apart, tender sweet potato, this is the recipe for you! The most detailed yogurt recipe on the web! A comment from a reader, Absolutely my favorite IP yogurt recipe. I have made this several times using your tips and it turns out perfect each time!!! The FAST and EASY method to making homemade yogurt. This recipe is ALMOST too easy! Forget green rings or under-cooked eggs. This is the fail-proof method to getting PERFECT instant pot eggs every single time! You will never believe just how easy it is to make homemade applesauce with the pressure cooker–you don’t even have to peel the apples for this recipe! This is a STAPLE recipe at our house. This easy Italian Tomato Sauce tastes like it has been simmered for hours but it ready in less than an hour. These are perfect to top Homemade Ramen with! I use a CRAZY ingredient in this Tahini-free Hummus, that makes it INCREDIBLY smooth in taste and texture. PSST–no soaking or cooking of chickpeas prior to making the hummus!! Beet Hummus may sound odd (it did to me at first too). But MAN, Pressure Cooker Beet Hummus is DELICIOUS! When I first tried out this method of steaming my pot stickers in my pressure cooker, I was terrified it would be a huge disaster. Instead, the moist heat of the pressure cooker, steamed a large batch of homemade pot stickers so easily. And this is one of the tastiest ways to eat leftover veggies. These chicken wings are the perfect appetizer. Ready in less than 30 minutes, these Buffalo Chicken Wings are the most tender and flavorful chicken wings you will ever have. A million ways to flavor oatmeal, but this is the creamiest, tastiest way to make oatmeal. PERIOD. If you like your oats with more texture, this is the recipe for you! Steel cut oats cook evenly and faster thanks to the magic of the Instant Pot! My family’s favorite Hash Brown Breakfast Casserole, made in the pressure cooker. The texture is a bit softer (like sous-vide eggs) but delicious! 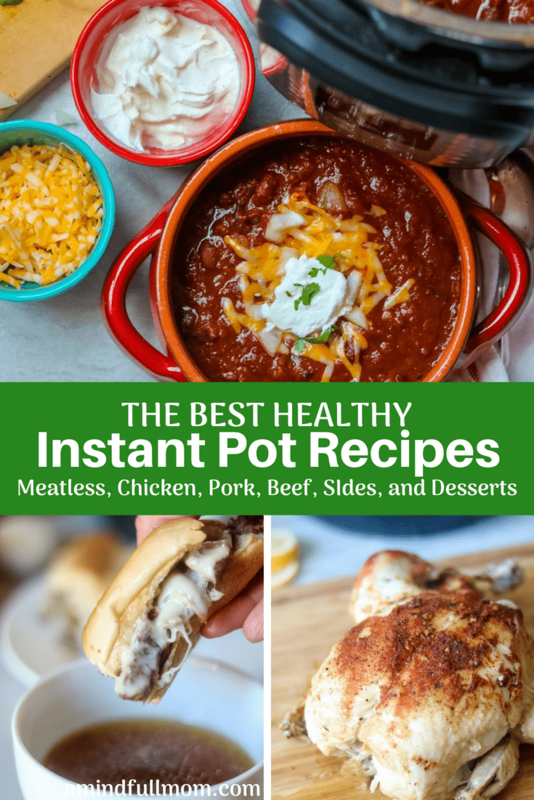 Get healthy family meals on the table in NO time with Easy Healthy Instant Pot Recipes. A comment on Facebook, We can’t get enough of this recipe. Even the picky husband LOVES it! A hearty and healthy chicken chili has never been easier with the help of a pressure cooker. Another fan favorite. This comment sums it all up, Holy cow! Awesome recipe and awesome Instant Pot!! The chicken turned out so moist and juicy, it was so tender that it fell apart as I pulled it out of the pot, and holy cow the stock it made is wonderful! A 30 minute meal from hitting start to pressure release, this Jambalaya is so full of incredible flavor. One reader states, This turned out delicious! Great flavor and super easy. I have to be honest, this was one of the first recipes I tried in the Instant Pot and it was a horrible failure. I kept trying and am happy to report–this recipe is INCREDIBLE! A reader stated, This turned out so well! The leftovers were almost as good as the firsts. Perfectly seasoned and cooked chicken thighs made with crispy skin. In less than 30 minutes you can have homemade Chicken Marsala that is worthy of restaurants. With a few tricks, the Instant Pot creates the most flavorful Marsala sauce you have ever had. This delicious instant pot recipe for Mexican shredded chicken breasts is perfect to use in salads, tacos, enchiladas, or wraps! This will be your go to Mexican Chicken recipe. This herb seasoned turkey breast is cooked to perfection and is served with an easy gravy made right in the Instant Pot. White Bean Chicken Chili is one of our favorite family meals ever! This Instant Pot White Chicken Chili is hearty, healthy, and made in a fraction of the time that the traditional recipe takes. This is the EASIEST version of Chicken Noodle soup! But just because it is easy, it does not sacrifice ANY flavor!! Seriously the BEST chicken tacos ever–not to mention the EASIEST! This recipe is my husband’s FAVORITE. On Pinterest it is pinned as “This is the French Dip that WORKS! !” A keeper for sure! These steak fajitas can be made with a less expensive cut of beef, thanks to the magic of the Instant Pot. So easy and so tasty! Chili tastes like it has simmered for days, yet is really made in less than an hour in the pressure cooker. Sweet and savory and perfectly tender beef is made with a delicious sauce in the pressure cooker. You can even cook rice at the same time for an extremely easy one pot meal! This lasagna is out of this world good and easy enough for a weeknight. An amazingly tender and flavorful pot roast all made in the pressure cooker. Served with potatoes and carrots, this is sure to be a family favorite. Hands down, the BEST beef stew recipe ever. PERIOD! Tender and flavorful meatballs made right in the pressure cooker. One of my family’s absolute FAVORITE recipes!! So incredibly easy and perfect for picky eaters. Such a flavorful and time-saving way to make Corned Beef and Cabbage. BBQ pork is favorite, and this pressure cooker pulled pork is incredible. Pork loin is cooked in a perfect blend of seasonings and until it is incredibly tender! This is perfectly cooked pork tenderloin with a delicious side of apples and sweet potato mash on the side. You will NEVER want to make ham any other way. This ham is juicy and flavorful and incredibly easy to make. It is incredibly easy to make Pork and Sauerkraut in the Instant Pot! Pork loin is cooked to perfection and flavored with a sweet and tangy sauerkraut and apple mixture. A creamy, hearty copy-cat version of Olive Garden’s Zuppa Toscana. This recipe is easier than any boxed mix but tastes so much better! Dried beans and brown rice cook up together with just the right about of seasonings for a hearty meatless main course, or a perfect side dish for taco night. This is the BEST recipe for Butternut Squash Soup. This healthy soup is a copycat recipe of Panera’s Butternut Squash soup with a vegan option. Creamy and cheesy, this pressure cooker mac and cheese comes together almost effortlessly and is made with all real food. My family’s generations old recipe redone to be made with dried beans and in no time thanks to the Instant Pot. These are the creamiest, softest, most perfect refried beans you will have ANYWHERE! They remind me of Mexican Restaurant’s smooth and creamy refried beans no one can resist. The pressure cooker yields the tastiest, most tender quinoa ever–in less than 10 minutes TOTAL time! Perfectly crisp-tender steamed green beans made in minutes in the pressure cooker. Perfect to get veggies on the table easily. Creamy, mashed potatoes made in less than 30 minutes from start to time on the table. This is an easy MUST-TRY recipe. Tender, yet crispy new potatoes make a PERFECT side dish to any meal. Creamy, cheesy and made without constant supervision and care–this is how to make risotto. Creme Brulee cooks best in moist heat, which is just what the Instant Pot provides, making this nearly FAIL-PROOF! The Instant Pot creates a cheesecake with a perfect (crack-free) texture! YAY! This recipe is a must try! A creamy delicious pumpkin cheesecake made in the pressure cooker. This pumpkin cheesecake is perfect for Thanksgiving.